The feast day of the Meeting of the Lord, the second day of the Sts. Sebastian and Mardarije Orthodox Institute began with the Holy Hierarchical Divine Liturgy. 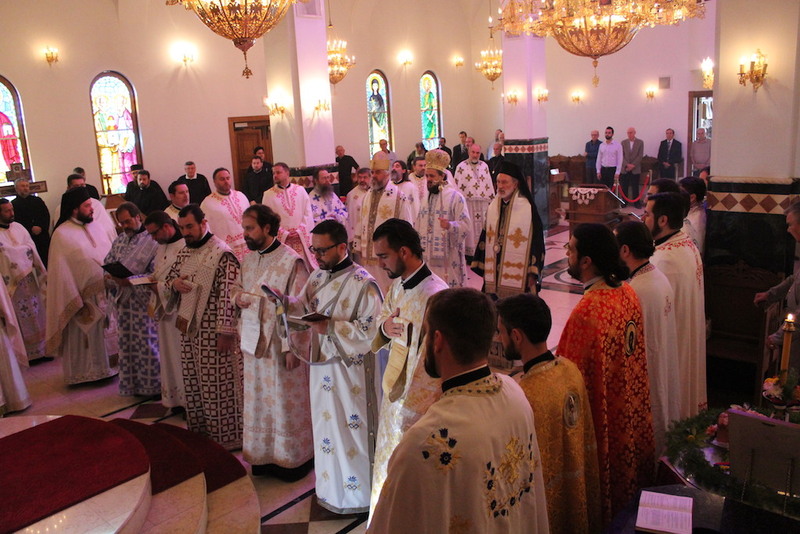 Officiating at the Divine Liturgy was His Grace Bishop Maxim of Western America with the concelebration of Bishop Irinej of Eastern America and Bishop Kirilo of Dioclea, twenty-six priests, and six deacons. The liturgy was followed by the cutting of the Slava Kolach on the occasion of the local parish Kolo Slava. In his address after the service Bishop Irinej said: “My dear beloved Bishop Maxim thank you for joining us and leading us in celebration of this holy and divine liturgy. I also thank their Graces Bishop Kirilo for con-celebrating with us and His Grace Bishop Longin who is also here present. I thank the clergy who have gathered from all over. And on this day kindly allow me to express my heartfelt sentiments with regard to the great national feast day of our Serbian people, in addition for this being the great feast of the Meeting of the Lord. For today is the day of Serbian national statehood as we celebrate as a people. And it is no mere coincidence that we celebrate on this glorious feast of the Meeting of the Lord. For on this day during the course of the First Serbian Uprising we gained our freedom from the Ottoman Empire and its clenches and thereafter we on this day proclaimed the Serbian Constitution, one of the first constitutions ever proclaimed in modern day Europe. Truly a great achievement for a small people such as we are and we deserved our rightful place among the nations of the world. And finally, I would be entirely remiss if I did not once again reiterate my congratulations to our dear Sisters from our Kolo Srpskih Sestara who on this day celebrate their own patronal feast. As the late Metropolitan Irinej once stated, the church is like a plane and it cannot fly without its two wings. With one wing, which is the Kolo Srpskih Sestara it flies to the heavens and it soars with the other wing which is the choir that sings at the Divine Liturgy." Thereafter, His Grace added, “I would be entirely remiss if I did not mention that this day is also the Feast our Unification, for on this day in 1992 our Church in the Diaspora was reunited through the celebration of the Liturgy of Reconciliation in the Belgrade Patriarchal Cathedral celebrated by Patriarch Pavle, together with Metropolitans Irinej and Christopher, and other members of the Holy Assembly of Bishops.” Thereafter His Grace added, "I would be remiss if I did not mention that this day is also the Feast of our Unification, for on this day in 1992 our Church in the Disapora was reunited through the celebration of the Liturgy of Reconciliation in the Belgrade Patriarchal Cathedral by Patriarch Pavle, together with Metropolitans Irinej and Christopher, and other members of the Holy Assembly of Bishops." Following a continental breakfast, the clergy and participants of the Institute reassembled in the meeting hall where Bishop Irinej introduced guest speaker Fr. John Behr. Fr. John is Dean, Rector, Director of the Masters of Theology Program and Professor of Patristics at St. Vladimir's Seminary in Yonkers, New York. In his talk, entitled “Creation and Becoming Human: Protological or Eschatological?“, he spoke of the need to read Scripture as Scripture. Just as Moses is described as having a veil over his face when speaking to the people to shroud the glory of the Lord, all of Scripture is veiled, hidden, until the coming of Christ, more specifically until His Cross and Resurrection. This unveiling or revealing is oftentimes described in Scripture as being an “apocalypse“ which means, a revelation. When St. Paul writes to the Romans he refers to this when he says, “to him who is able to strengthen you, according to the apocalypse of the mystery which was kept secret for long ages....“ (16:25-27). God the Father is the one who reveals – unveils the mystery - to St. Peter, allowing him to confess that Christ is the Son of the living God. All the Apostles, and in fact the whole world, will be able to know this after the Lord's Passion and Resurrection that's why the Lord calls Peter satan after he tells the Lord he doesn't want Him to go to his suffering. Anyone who places themselves between Christ and the Cross is the enemy, Satan. The reading of scripture, therefore, is cryptic: it is unveiled; it is harmonious: it speaks about Christ from beginning to end; it is contemporary: that's why Christ will say “Moses spoke about Me...“, in other words, what Scriptures talks about is not merely historical but in the here and now; and it is inspiring not in a modern sense of the word that we are “inspired however we read it“ but rather it was the prophets and apostles who were inspired by the Holy Spirit.